From 1860 to the early 1900s the lure of profits from harvesting timber brought the first non-Native settlers to what later became Kenmore. The virgin forests consisted mostly of fir, hemlock, and cedar. 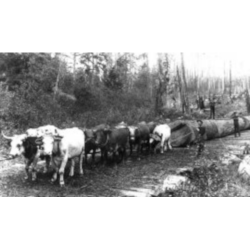 Early logging methods were wasteful. Only the best and most accessible trees were harvested. Loggers sawed the trees off anywhere from 9 to 20 feet above the ground so they didn’t have to move the large, bulky stump ends over the “skid roads”—the wide paths leading to the nearest mill, log dump, or water where the logs were floated to mills farther south on Lake Washington. Because the mills wanted straight and regular logs, as much as fifty feet of the top of the trees were cut off. The remaining slash was burned. In 1901, John McMaster established a steam-powered shingle mill on Lake Washington. The mill operated just north of the site that decades later became the Kenmore Air Harbor. McMaster and his family had moved to Washington state from Kenmore, Ontario, a connection that explains how the settlement that grew up around the new mill got its name. By 1920, most of the forests were gone, leaving a denuded landscape where stumps stood like shrunken ghosts of the fallen forest giants. The source of timber was not inexhaustible after all.